G.C. "Arlen's Fabulous Moolah"...a broken black Sr doe. Moolah passed away on 06/28/08. She was 4.5yrs old. She was the base of most of my herd and can be seen in many pedigrees all over the USA. She's produced outstanding offspring for many generations and was know for having the most outstanding hindquarters in her younger days. I always joked that if the barn caught on fire there'd be no dout in my mind that she'd be the one rabbit I would save if I could only save one. Hannah loved her and will miss her too. 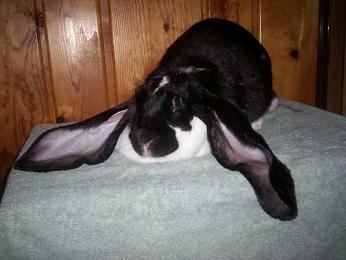 She used to tell everyone that Moolah was HER rabbit lol. In her life-time she recieved many legs and trophies and was complimented on by many judges. She'll definately be missed and I think it'll be hard for any rabbit to fill the gap where she used to be. "GC LLR's Jimmy-J"...a std Sr doe. 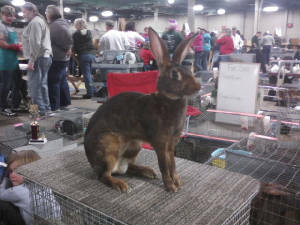 "GC Imagination Acre's Oliver"... sr buck.